It has been about five years since the arrival of 25G Ethernet in 2014. For those years, the 25G Ethernet market has been filled with ups and downs. Facing with the broad adoption for 100G Ethernet and the upcoming new connection speeds of 200G/400G, the use of 25G devices, like the 25G switches, has been in doubt. 25G Ethernet is one of the standards for Ethernet connectivity in a data center environment, developed by IEEE 802.3 task force P802.3by. 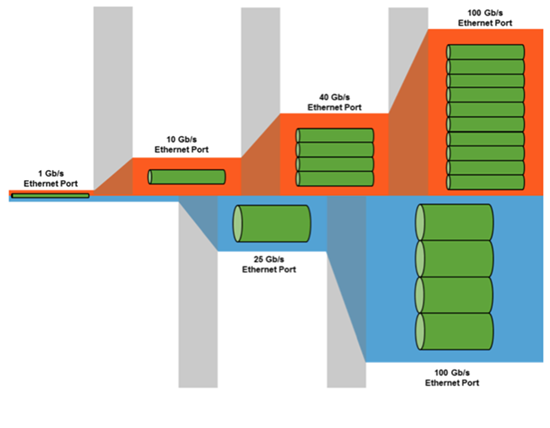 Before 25G Ethernet was proposed, the next speed upgrade for data centers was expected to be 40G Ethernet (using four lanes of 10G) with a path to 100G defined as using 10 lanes of 10G. Now, with the 25G Ethernet standard, it supports to have four 25 Gbps lanes to achieve the speed of 100G Ethernet. In that way, it is said that 25G has paved the road for 100G. With the 25G standard carried out, in 2016, its matching equipment was also available on the market, such as 25G SFP28 transceiver, DAC cable, 25G adapter, and 25GbE switch. Among those devices, the 25G Ethernet switch is the most representative one. Nowadays, the 25G switch market is mainly led by some branded vendors such as 25G Dell, Cisco, Juniper, Arista, and Mellanox switches. Usually, the 25G 48-port switch is the most popular type. 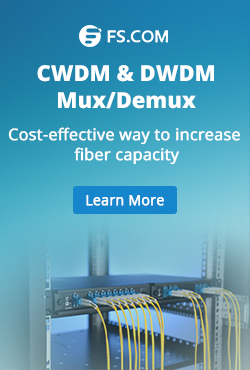 Most 25G switches today offer two types of 25GbE interface form factors: QSFP28 that can support 4x25Gbps and SFP28 that can support 1x25Gbps. No matter for TOR (Top of Rack) switch or as the switch to deploy spine-leaf architecture, 25GbE switches will be the good choices. Why Still Need 25G Ethernet Switches? The majority of 25G Ethernet switches in the market support backward compatibility. 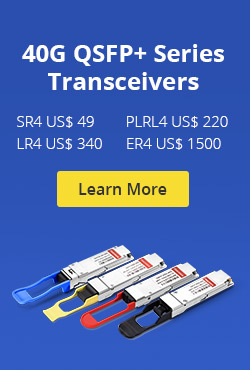 Because most of their matched optical transceivers are SFP28. And SFP28 is regarded as the enhanced version of SFP+, which is designed for 25G signal transmission. SFP28 utilizes the same form factor as SFP+, but the electrical interface is upgraded to handle 25Gbps per lane. As SFP28 adopts the same form factor as SFP+, SFP28 can connect with SFP+ ports and SFP+ transceiver can also connect with SFP28 ports. SFP28 is compatible with existing data center fiber cabling. Thus, you can greatly reduce the cost of re-architecture data centers and gain great flexibility in creating higher bandwidth during migration. To some extent, it can be both CapEx and OpEx savings. The 25G technology is similar to 10G, but the performance is increased by 2.5 times, thus reducing the power and cost per gigabit significantly. 25G Ethernet provides higher port and system density. For example, four 25 Gb/s data streams can be used to produce a 100G path over copper or fiber cable within a compact form factor. This approach also saves on energy consumption and requires fewer top-of-rack (ToR) switches and cables, which cuts much operational expenditure for data center operators in the end. As we can see in the Crehan forecast in figure 3, 25G delivers on both fronts with better price and performance. 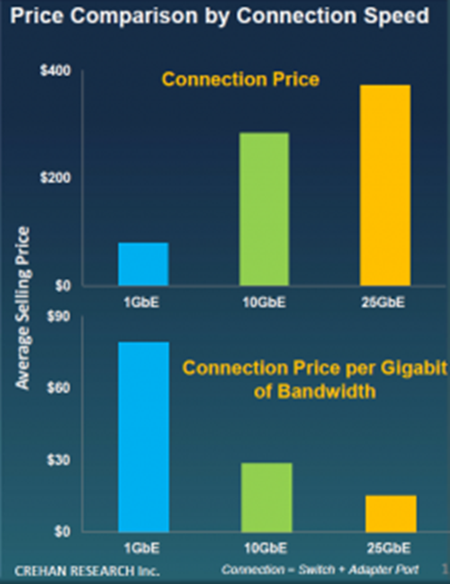 While 25G Ethernet is slightly more expensive than the 10G pricing, when valued with price and performance it is much cheaper on a per Gbit/s of bandwidth. In fact, the 25GbE pricing is very competitive, with only a 30%-40% premium over 10GbE and this premium is expected to come down over time. To achieve these competitive pricing levels requires devices that are optimized to support 25GbE. In that case, deploy 25G devices, such as 25G Ethernet switches are necessary. With the trend for higher Ethernet bandwidth, the demand for 10G Ethernet has been in decline. Before the 200G/400G Ethernet becomes mature, 25G shares lots of incomparable strengths to be considered as the proper choice to prepare for the upcoming migrations. In the context of that, 25G devices, such as 25 Ethernet switches are playing indispensable roles. This entry was posted in Fiber Optic Switch and tagged 100g ethernet, 25g ethernet, 25gbe switch, 40g ethernet, Mellanox switch, QSFP28, sfp 28, spine-leaf architecture on January 17, 2019 by Camilla.Zhang.